Figure 1: Pre-operative appearance of melanoma within the metatarsal paw pad. Previous surgical biopsy was performed in the centre of the mass. 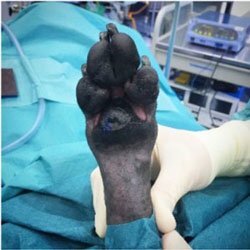 Leopold is a 10-year-old, male neutered, standard schnauzer that was referred to Brisbane Veterinary Specialist Centre (BVSC) for management of malignant melanoma of the metatarsal pad (Figure 1). An incisional biopsy of the mass had been performed by the referring vet at Noosa District Animal Hospital and the mitotic index was 10 (10 figures per 10 high powered fields). Malignant melanoma is an aggressive neoplasm with a potentially high risk of metastasis. Breeds including black cocker spaniels, Scottish terriers, Boston terriers, golden retrievers, boxers and schnauzers are over-represented. Commonly affected sites include the oral cavity, mucocutaneous junctions, nail bed and foot pad. Prognosis varies between different anatomical sites; haired skin tumours often behave in a benign manner while oral tumours are highly aggressive. 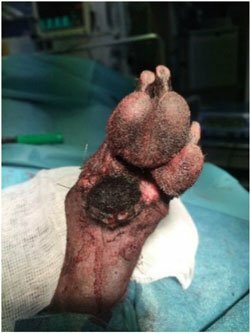 Melanoma of the digit and footpad have metastatic rate of approximately 40 per cent with median survival time (MST) following surgery of approximately one year. Pre-operative staging is usually performed by local lymph node cytology or histopathology, abdominal ultrasonography and thoracic radiography. If staged clear then wide surgical resection is recommended. Figure 2: Intra-operative photograph following complete resection of the metatarsal paw pad. In Leo’s case, wide surgical resection required complete removal of the metatarsal pad. The paw pads of dogs and cats are specialised skin structures that provide cushioning, abrasion resistance and traction. A variety of techniques involving transfer of durable pad tissue into areas of pad loss have been described; in this case we elected to perform transposition of a local digital pad by the phalangeal fillet technique.1 The metatarsal pad was resected using electrocautery and sharp dissection (Figure 2). An elliptical incision around the nail bed and palmar incision along the phalanges of digit two were performed. Blunt dissection of the soft tissues as close to the phalanges as possible was performed, taking care to preserve blood supply to the digit skin (Figure 3). The phalangeal bones were removed and the resulting skin flap was transposed into the metatarsal pad defect and sutured in place with buried interrupted and external skin sutures (Figure 4). Melanoma of the digit and footpad have metastatic rate of approximately 40% with median survival time of one year. Figure 3: The phalangeal bones of digit 2 have been removed from the surrounding soft tissues, taking care to preserve blood supply to the skin flap. The foot was placed in a padded bandage that was changed weekly and removed three weeks post-operatively when the skin was healed. Histopathology of the resected metatarsal pad confirmed the diagnosis of malignant melanoma with complete surgical margins. The local popliteal lymph node, which was removed at the time of surgery, was clear of metastatic disease. Despite appropriate local control there is still risk of distant metastasis developing. A variety of chemotherapeutic agents have been attempted to delay spread of disease, however, little data exists to demonstrate effectiveness. A murine xenogenic DNA vaccine for canine oral malignant melanoma (Oncept®) has been shown to induce antibody, T-cell and anti-tumour responses against melanosomal glycoprotein tyrosinase, which is essential in melanin synthesis. A recent study investigated digit Melanoma treatment with surgery and Oncept® vaccine and demonstrated 476 day MST with a one-year survival rate of 63 per cent; improved compared to historical controls of 365 day MST with a one-year survival rate of 44 per cent.2 The Oncept® vaccine is administered fortnightly for four doses following surgery, with booster injections given every six months. Figure 4: Post-operative appearance following transfer of the digital paw pad skin flap to close the metatarsal pad defect. Leo continues to do very well following surgery and is walking without any lameness. His follow-up will include monthly physical examinations for three months then every three months for a year and we will encourage the owners to have thoracic radiography performed at the three monthly rechecks. 1. Olsen D, Straw RC, Withrow SJ, Basher AW. 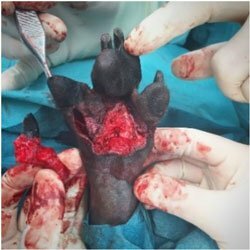 Digital pad transposition for replacement of the metacarpal or metatarsal pad in dogs. J Am Anima Hosp Assoc 1997;33:337-41. 2. Manley CA, Leibman NF, Wolchock IC, et al. Xenogenic Murine Tyrosinase DNA Vaccine for Malignant Melanoma of the digit of Dogs. J Vet Intern Med 2011;25:94-99. Dr Katherine Steele, a board certified small animal surgeon, graduated from the University of Queensland in 2008. 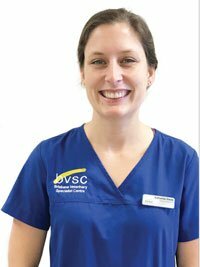 She completed a rotating and surgical internship in Brisbane prior to relocating to Victoria for a residency at Melbourne University in small animal surgery. She completed a Masters of Veterinary Studies in 2016 and a Masters of Veterinary Science in 2017. Her interest in oncology led her to Brisbane Veterinary Specialist Centre. Vet Practice magazine and its associated website is published by Engage Media. All material is protected by copyright and may not be reproduced in any form without prior written permission. Explore how our content marketing agency can help grow your business at Engage Content or at YourBlogPosts.com. Is marketing worth the effort?